Mr Masten invites his many friends in the Genesee Valley Country to visit him at the Frank A Rivers Furniture Co. He will be pleased to advise and assist in your selection of quality furniture, rugs, appliances, etc. Come in anytime. For over 42 years the Frank A Rivers Furniture Company has provided the folks of Rochester and the whole Genesee Country with fine quality furniture at reasonable prices. Throughout the years Mr Frank A Rivers has maintained an enviable reputation for reliability, integrity, and honest dealing, for giving his customers full value, and a little extra, for their furniture dollars. You'll get courteous attention and quick service always, and of course, easy budget financing can always be arranged. The painted sign is wonderful, a great find. I guess the Timmy's sign will block some of the sun, so it may last longer. I love seeing signs painted directly on buildings. I've seen some that are decades old. There's something exciting about finding these. Love the old sign! too bad about Timmy's sign! 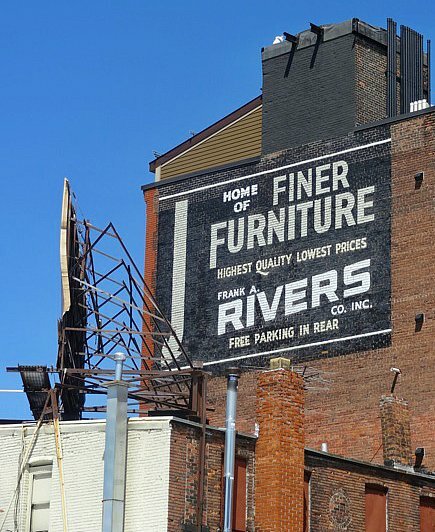 Love these old painted signs. 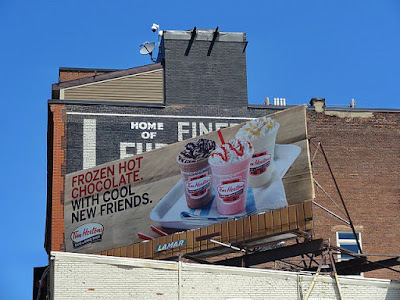 Too bad about the Tim Horton's sign. There is some just wrong with frozen hot chocolate. Interesting post. I agree about the frozen hot chocolate - don't 'get' it.